After two years of negotiations US President Donald Trump is coming up against a wall, just not the one he expected. House of Representatives Speaker Nancy Pelosi and the Democrats are blocking his plans to build a physical perimeter between America and Mexico and only agreeing to fund additional security spending in exchange for concessions on immigration. After the five-week government shutdown, and the temporary damage that may have done to US growth, the President may now feel he needs some progress on the trade talks with China. That would create more of a feel-good factor at a time when consumer confidence is ebbing and the President’s insistence upon equating success in office with a rising stock market looks ever-more precarious. The 2 March deadline imposed by the G20 meeting in Buenos Aires last November is now approaching. If no deal is reached, America will increase existing tariffs on $250bn worth of Chinese goods and services and slap taxes on products so far unaffected. Stock markets are hoping for a deal and that may influence the White House. 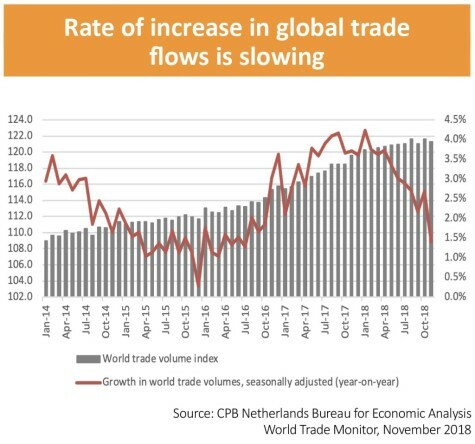 Equally, the President may just take an intransigent stance and refuse to budge, given his frequently expressed view that America will win any trade war, although the data suggest that global trade flows may already be suffering. Whether this is just down to Trump and tariffs or a wider economic slowdown is hard to divine but some form of settlement between Washington and Beijing is likely to be more welcome than the ongoing stand-off. 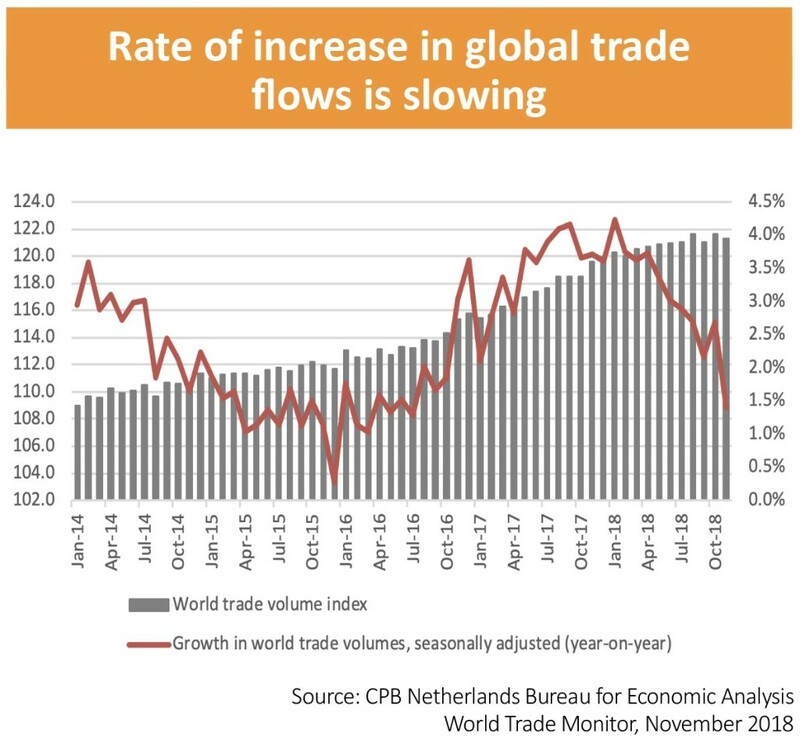 Data from the CPB Netherlands Bureau for Economic Analysis’ World Trade Monitor does suggest that growth in global trade rates is slowing, to add support to the view that 2018’s narrative about a ‘globally synchronised recovery’ is coming unstitched. Renewed strength could offer some reassurance on global growth while any slippage could warn of potentially tougher times ahead. 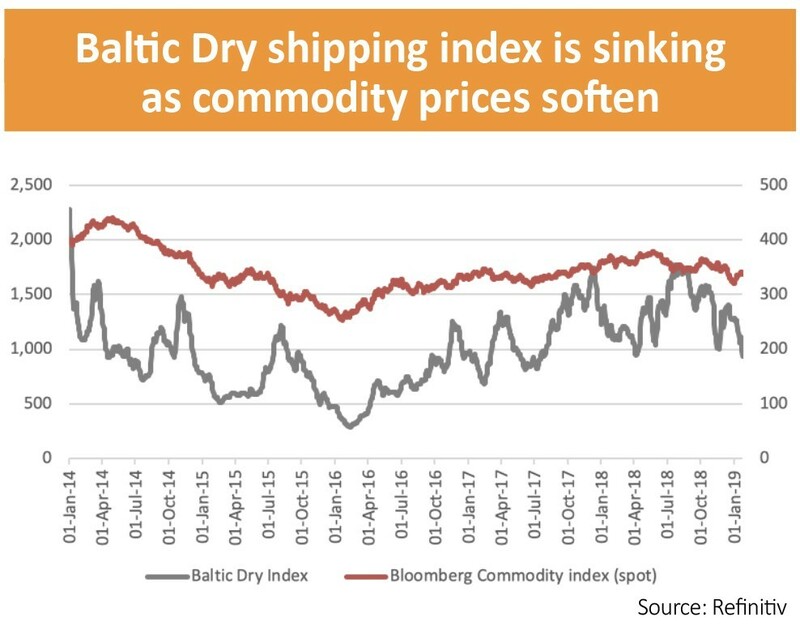 Investors might also be hoping for a less gloomy outlook from the Baltic Dry index, an indicator of bulk shipping rates across several classes of vessel and nearly 20 routes. Key cargoes include iron ore, coal and building materials as well as grains. 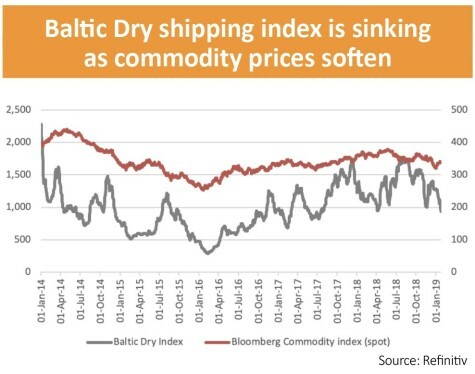 While vessel supply can be as important a factor as demand, it is of some concern that the Baltic Dry index has pretty much halved since last summer. The Bloomberg Commodity index, which includes many of the raw materials carried by bulk shipping firms, is down too, albeit by a more sedate 11%. The economic data thus look mixed but financial markets are discounting mechanisms that price in future events. Since the above data is widely available the chances are it is already priced in and markets are looking ahead to what is coming next. This makes the Dow Jones Industrial Transportation benchmark in the US particularly interesting, at least according to the late Richard Russell’s Dow Theory. The logic here is that it can only be good news if the share prices of the firms moving goods around the world by road, rail, sea or air are doing well. If something is sold, it has to be shipped. Equally, weak transport stocks could mean inventories are piling up on shelves and forecourts, to herald production cuts and a potential downturn in industrial activity, economic output, corporate earnings and potentially stock market valuations. 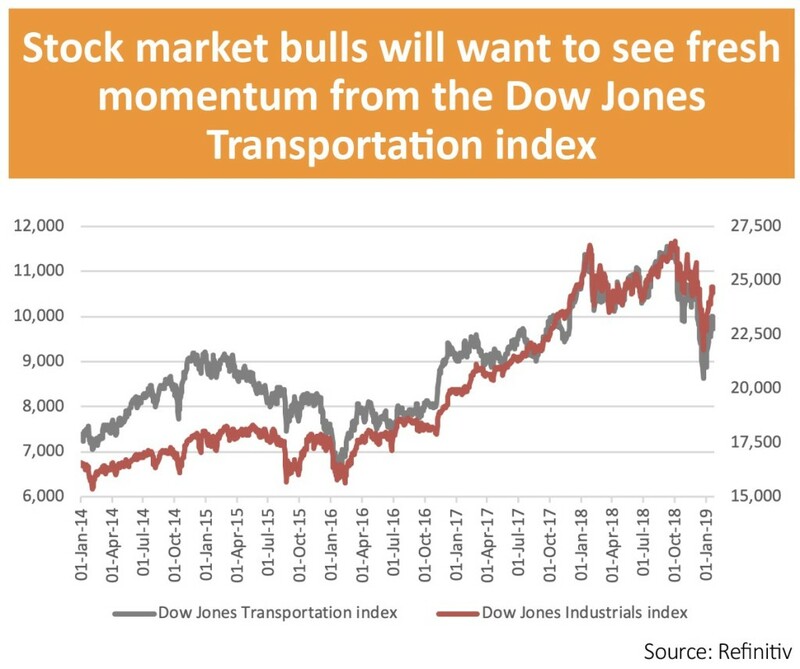 For much of 2018 the Dow Jones Transportation index led the better-known Dow Jones Industrials index lower. American trucking, rail, shipping and air stocks are forging a rally in early 2019 but the Dow Jones Transportation index still stands 15% below its September peak. A trade deal with China and the US may help it to gather fresh momentum, whereas signs of American economic weakness would not. If following all of these different benchmarks is too much for time-pressed investors then perhaps one stock will do. 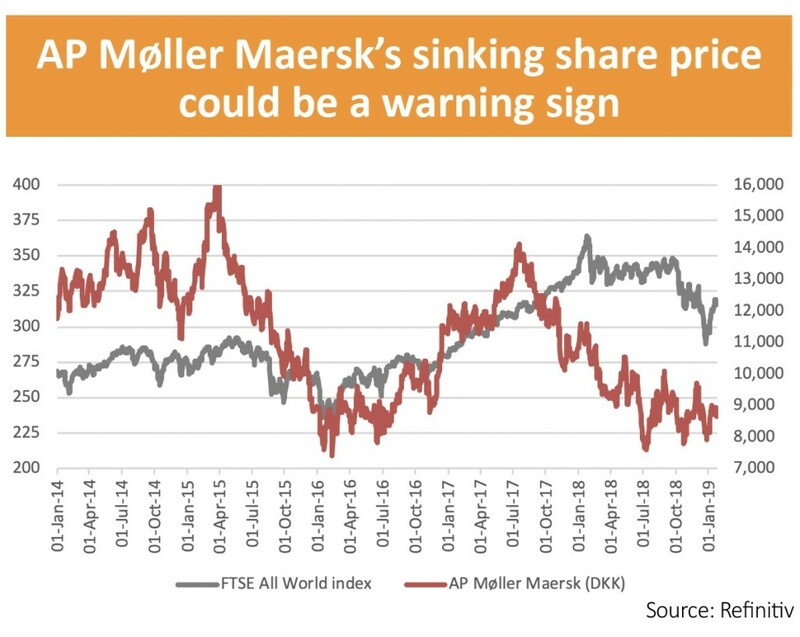 This firm is the Copenhagen-quoted AP Møller Maersk, the world’s largest container shipping company, a status which may make it a decent proxy for global growth. When a longstanding relationship with the FTSE All-World index broke down in 2017 it was tempting to attribute this to shareholders’ disaffection with a decision by chief executive Soren Skou to break up the company and sell its energy operations. 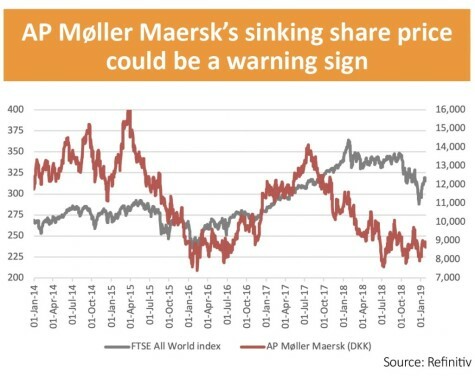 Yet AP Møller Maersk’s shares have continued to sink. Global trade data and other transport stocks have started to follow it lower. Investors can therefore look to Denmark for indicators whether there is something rotten with the state of the global economy or not in the weeks and months ahead.